In October 2017 I hosted four workshops in New Zealand at Wellington, Napier, Kawhia and Auckland. 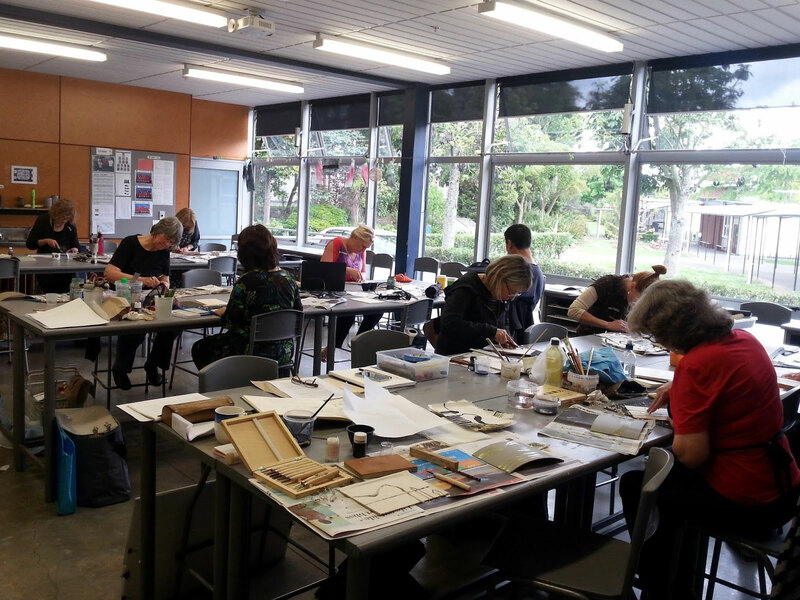 These were organised by Kathy Boyle for the Print Council Aotearoa New Zealand. I focused on painterly methods applied to relief printmaking. We began each workshop with brush and ink sketches on Chinese paper working with the theme of the ‘mountain’. Various methods of transferring the images to Japanese maple plywood were presented. Each participant worked with three pieces of plywood to create woodcuts. Etched lino was also introduced as another painterly method. The blocks were then printed in various ways using transparent inks and layering. The final results were unique and exciting with each person shaping their images to evoke the ‘mountain’. Everyone was heads down and engrossed.